Congratulations to the winners of the autographed books giveaway. Death Books a Return by Marion Moore Hill will go to Marlyn B. of Los Alamitos, CA. And, Killer Keepsakes by Jane K. Cleland goes to Judy L. from Litchfield, IL. The books will go out in the mail tomorrow. This week, I feature two authors whose initials are S.J. I have an ARC of S.J. 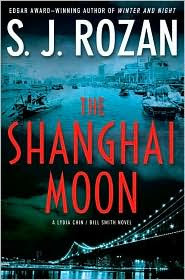 Rozan's Shanghai Moon. Lydia Chin is estranged from fellow private investigator Bill Smith when she takes on a case of stolen jewels dating back to World War II. However, disaster follows as a coworker is murdered, and Lydia is fired. Lydia and Bill reunite to find the truth about the Shanghai Moon, one of the world's most sought after gems, and the events around its disappearance. S.J. Bolton's second mystery, Awakening, has just been released. 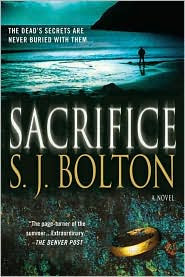 I haven't had a chance to read it yet, but I thought her debut, Sacrifice, was powerful. I reviewed it a year ago. I have a trade paperback of that to offer, just released as well. It's the story of an outsider in the Shetland Islands, who digs up a body. Obsessed with the woman, Tara Hamilton investigates until the police, her colleagues, and even her husband warn her against getting involved. Would you like The Shanghai Moon or Sacrifice? You can enter to win both, but I need two separate entries. If you'd like to win one, email me at Email me!. If that link doesn't work for you, the email address is: lholstine@yahoo.com. Your subject line should read either Win "Shanghai Moon" or Win "Sacrifice". Your message should include your mailing address. Entrants only in the U.S., please. The contest will end Thursday, June 25 at 6 p.m. PT. Jim will draw the winners at that time. The winners will be notified, and the books will go out in the mail on Friday. Good luck! these look great - i will email now!